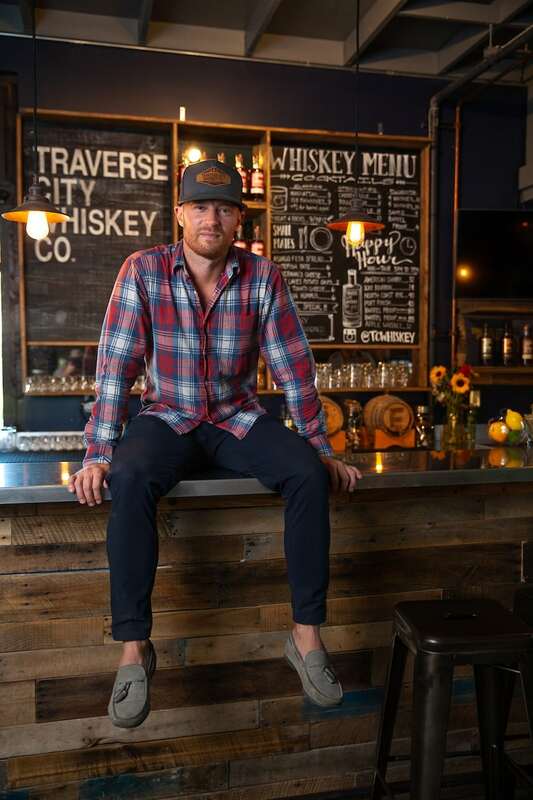 Upon discovering a set of his great-grandfather’s distilling patents at the family farm, a whiskey wormhole opened up for Traverse City native, Chris Fredrickson that led to the founding of the Traverse City Whiskey Company in 2012 and their downtown distillery two years later. We sit down with Chris to talk whiskey mechanics and get an Ol’ Fashioned recipe to ward off the first freeze. In a world flush with whiskey, how does Traverse City Whiskey Company stand apart? With each whiskey we try to find a differentiator that ties it to the area and reflects our values and heritage. Since cherry farming is a true marker of Traverse City, our American Cherry Edition is infused with Northern Michigan cherries. We’re also producing limited-edition Michigan apple and maple syrup-infused whiskeys. How does whiskey infusion work? For the fruit whiskeys, we use our Traverse City Straight Bourbon as the base whiskey and each barrel, after it’s completed aging, is macerated with 10 pounds of local fruit for 10 days so the whiskey takes on the subtle essence of cherry or apple. What role do the barrels themselves play? In our world the water, and even more so the wood, are the key components to great whiskey. We work with generational coopers in Kentucky and Tennessee to get top-quality American oak with a lighter char to help the whiskey mature with more complexity and elegance. Let’s start drinking. What kind of whiskey glass should we have behind the bar? You need two, actually. The first is an 8–10 ounce tumbler or “Old Fashioned” glass for making whiskey cocktails or sipping it on the rocks. The second is a Glenacairn glass that focuses the whiskey’s aromas when drinking it neat. Straight sippin’ aside, what’s the best way to drink whiskey this November? My favorite is our Stillhouse recipe for an Ol’ Fashioned. You can stop by and drink one at our happy hour sessions Monday through Thursday from 3–7 p.m. or make it at home (recipe below). The North is filthy with craft distillers kicking out some of the best brown liquor north of Kentucky. Stash a few of these. In a rocks glass muddle the orange wedge, bitters and simple syrup. Add the whiskey and ice cubes, stir to combine and garnish with the cocktail cherry. Traverse food and drinks editor Tim Tebeau writes from Petoskey. // Dave Weidner is a freelance photographer based in Traverse City.